A coconut crab was caught on video tearing apart and devouring a red-footed booby in one of the most disturbing videos you're likely to see. The giant coconut crab has never been known to be a meat-eater, but a shocking new video shows it devouring a seabird as it sleeps in one of the most disturbing things you’re likely to see. 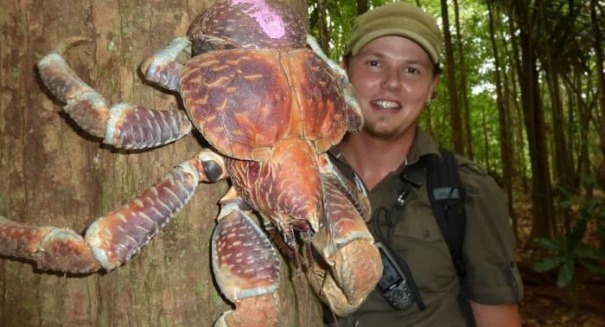 The coconut crab is massive and typically dines on coconuts, as its name implies, but this time around the crab had a different type of prey in mind. The video is embedded at the bottom of this post. This crab came upon a sleeping red-foot booby as it rested on a branch, and then it uses its powerful claws to snap through its body even as it is still alive. Even more disturbingly, the commotion attracted a number of nearby crabs who came by to also feed on the easy meal. Coconut crabs can grow to be absolutely huge, as large as three feet across. It has thrived on islands where they don’t have any natural predators. The crab is the largest arthropod in the world and is probably as large as any terrestrial animal with an exoskeleton can get.